Our Gourmet Club met last weekend for another one of our fabulous dinner parties. We have 11 couples in our club and we meet for dinner once a month. This time it was our turn to host, and I chose a Greek theme. The hosts are responsible for planning the whole menu, preparing the main dish and then doling out the remaining recipes to the other couples. I know that 22 people sounds a little crazy for a dinner group, but not everyone attends every single dinner so we usually end up with fewer than 22. For our Greek party, we had 16 attending. I have a bit of an obsession with buying all kinds of dishes, linens, glassware, etc. I have loads of patterns & colors, and I love to mix & match. My husband and I fully intended to wear togas at the party… but we had some costume malfunctioning goin’ on and had to throw on regular clothes at the last minute! In keeping with the theme, we did play some rather festive Greek music. Since there were so many recipes involved in the making of this dinner party, I’m going to share them in three posts. Today I’m sharing the drinks and appetizers. Here’s what the menu looks like so far (and I’ll add to it in the next post). Each of the titles are linkable to the recipes. We started with the drinks. Everyone brought plenty of wine- some actually were able to get their hands on ‘Greek’ wine. I wasn’t so lucky. None of the wine shops I went to carried Greek wine. So we served Greek Mojitos instead. Typical mojito recipes are made with rum. 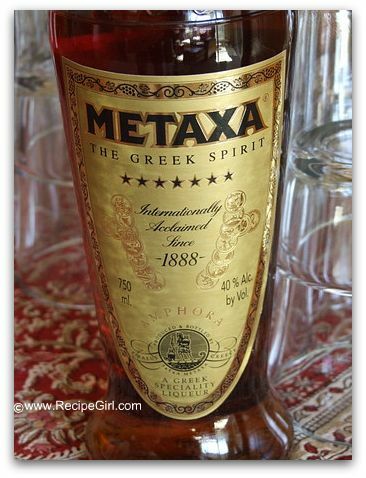 Greek mojitos are made with Metaxa (a Greek liqueur), which is much easier to find than the Greek wine! The Greek Mojitos were good… making them as directed, they were a little sour… so my husband cut down on the lemon/lime juice a bit and they were just right- a little sweeter. This one was amazing. The men were gathered around this platter gobbling it up. I heard many raves, and I thought it was excellent too. 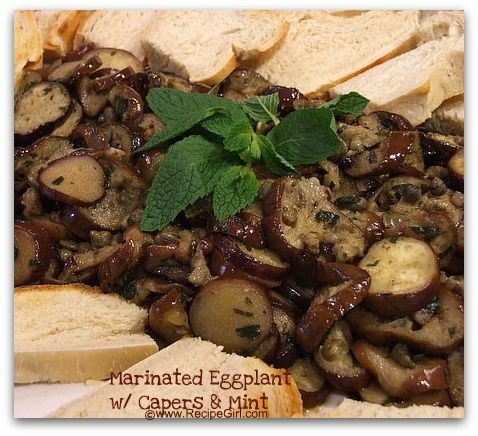 We served the eggplant with slices of toasted baguette. I wouldn’t hesitate to make this for any party- no need to be Greek! 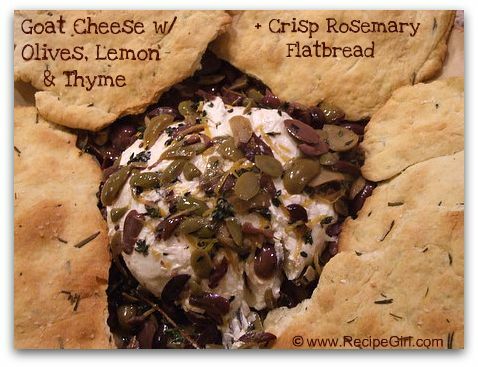 This one was super easy to make- both the goat cheese and the flatbread crackers. We kept the flatbread in big chunks, and everyone broke off their own shards to their desired size and spread the goat cheese onto the cracker. This was a delicious appetizer too, and it was impressive on the platter. Ding Ding Ding! Although we enjoyed all of the appetizers, this one was the big winner for me. Each of us took a bite into this one and were completely surprised at the flavor & texture. 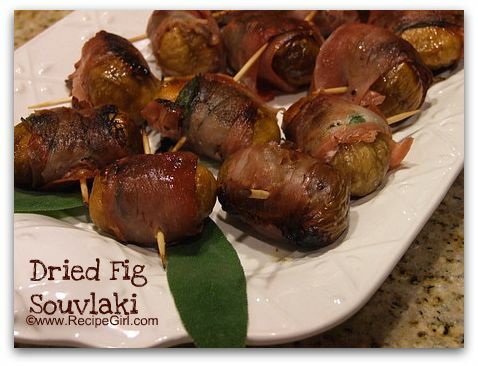 These were dried figs stuffed with feta, wrapped with sage & prosciutto and then sauteed. They were so, so good- definitely my favorite of the three. *Click recipe titles in the menu above to see actual recipes. 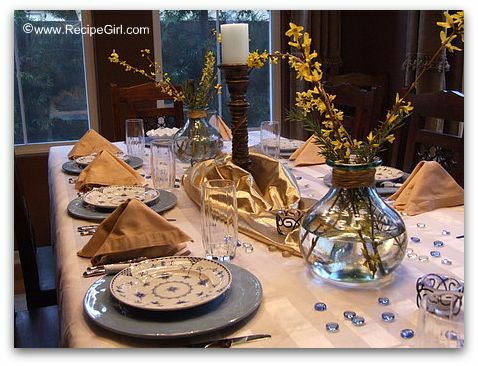 For the rest of the dinner party- click through to see…. @Cristy, Yes, they are “dried” figs. have you made everything yourself? loos very professional. just like in a luxus resteraunt. Finally trawling through this amazing spread. Took me long enough to get over here! Tables look fabulous! Always a challenge to seat more than 8 so clever you. So many outstanding recipes here I don’t know where to begin, but those stuffed figs definitely have my attention. Very nice. I love how you set up your tables, too! They look so beautiful and elegant! Where did you find the large, Greek figs? Cathy- I didn’t make the figs, but I’m pretty sure they were just dried figs that the gal picked up at the market (the ones you find in the produce section). It’s all Greek to me…but I think I like it! The sense of festivity is so wonderful in the pictures, and I can practically taste all of the delicious food! Beautiful table setting indeed! I love Crate and Barrel dishes myself, especially when they are topped with a Greek feast such as this. Your spread looks amazing! 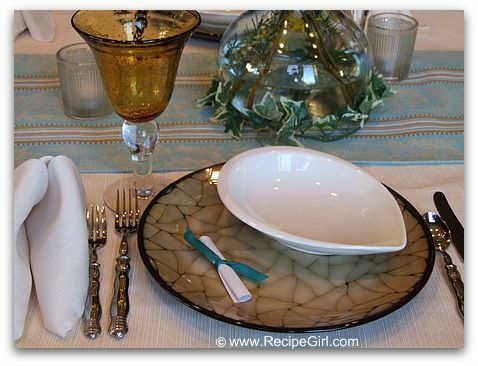 What a fun idea – now I want to start a dinner club! I love Greek food. I’ll look forward to the rest of the meal! I left a thank you for you on my blog. Your tables looked beautiful!!! I have an obsession for glass pitchers big and small! Your drinks and apps are wonderful, I can’t wait to see whatelse you made!! OH wow! I need to come over for one of your dinner parties. Everything looks fantastic. I would drink many of those mojitos. Looks like a fabulous meal. I love your place settings as well! That goat cheese with olives looks divine! It looks and sounds as if you did a superior job (of course, what else is to be expected). I love the goat cheese and olive appetizer; they are two of my favorite ingredients. I am looking forward to the remainder of your ideas! First, gorgeous table settings! Second, how fun to have such a cool club. Can’t wait to see the next installment!